After U.S. Court of Appeals for the 10th Circuit Judge Neil Gorsuch was recently nominated by President Donald Trump to be a United States Supreme Court judge, initial indications from Republicans suggested they will do whatever it takes to see him confirmed. Putting politics aside for other venues, I thought it would be interesting to review several intellectual property cases from the 10th Circuit with decisions authored by Gorsuch. Though patent issues would not have gone to the 10th Circuit (i.e., they are all appealed to the U.S. Court of Appeals for the Federal Circuit), it’s worth pointing out that Judge Gorsuch has expressed skepticism of what is known as Chevron deference: a principle of administrative law that requires courts to defer to interpretations of statutes made by those government agencies charged with enforcing them, unless those interpretations are unreasonable. Ending Chevron deference, as Judge Gorsuch would like to do, would have enormous consequences for all agencies—including the United States Patent and Trademark Office. This result, which is currently being contemplated by Congress, would also reopen previously settled patent rulings based on the USPTO’s interpretations of the America Invents Act. 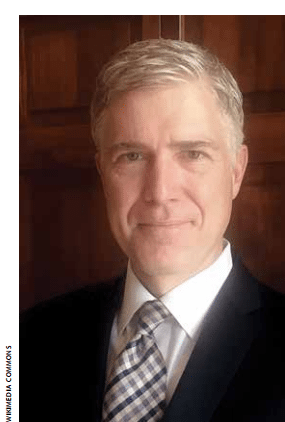 Last June 17, Judge Gorsuch authored the opinion in El Encanto, Inc. v. Hatch Chile Company. The dispute arose between these companies after Hatch Chile attempted to trademark the term HATCH for exclusive use relative to its chile pepper products. As Judge Gorsuch wrote: “The Hatch Valley may be to chiles what the Napa Valley is to grapes.” That is no doubt why El Encanto objected in filings before the Trademark Trial and Appeal Board. During the TTAB proceeding, El Encanto asked Hatch Chile to disclose the provenance of the chiles it used. Hatch Chile responded that it did not know, and that El Encanto should ask its co-packers and suppliers. Armed with that suggestion, El Encanto issued subpoenas under Federal Rule of Civil Procedure 45, which authorizes discovery from non-parties. Hatch Chile objected in federal court, seeking a protective order and a motion to quash. Hatch Chile argued that such a Rule 45 subpoena could only be used in conjunction with a deposition, which was not requested. The district court agreed. In Meshwerks, Inc. v. Toyota Motor Sales U.S.A., Inc., Judge Gorsuch authored an opinion on whether digital models are entitled to copyright protection. In this case, the facts showed that the models and their designs owed their origins to Toyota, and there was a deliberate choice not to include anything original of their own. As such, the 10th Circuit had little difficulty finding that the models in question were not original works of authorship entitled to copyright protection. Already, we have seen President Trump issue an executive order relating to the streamlining of the federal regulatory system, so the nomination of Gorsuch—who seems highly skeptical of the ever-increasing power of the federal regulatory system— should shock no one. Further, on January 11, the U.S. House of Representatives passed the Regulatory Accountability Act of 2017, which in part would modify the scope of judicial review for agency actions. If passed by the Senate and signed into law by President Trump, the act will authorize courts reviewing agency actions to decide all relevant questions of law de novo without giving deference to the agency’s interpretation. Passage of the Regulatory Accountability Act of 2017 would, in essence, do away with Chevron deference and thereby significantly open the door for the federal circuit to reconsider all of the patent office’s interpretations of the America Invents Act.